Golf clubs across North Wales are reaping the benefit from the “huge success” of a new online booking service. The decision by Tourism Partnership North Wales to concentrate its marketing on the internet is paying dividends. As a result, there has been a massive increase in online bookings which have generated nearly £500,000 in green fees over the past three years. Central to the success of the campaign is the www.golf-northwales.co.uk website built and is operated by top online tee time company, BRS. Customers can not only book online but also see images of the different golf courses as well as details about special offers and nearby accommodation. So far, 19 clubs across the region are signed up to the scheme and more are coming on board all the time. According to Tourism Partnership, they have also been able to tap into the surge in interest created by the Ryder Cup that’s being held at the Celtic Manor, in Newport, later this year. After the Olympics and the football World Cup, it’s the third biggest event in the global sporting calendar. Tourism Partnership Marketing Executive Carole Startin is delighted that the online booking service is proving such a success. She said: “It’s a huge success. 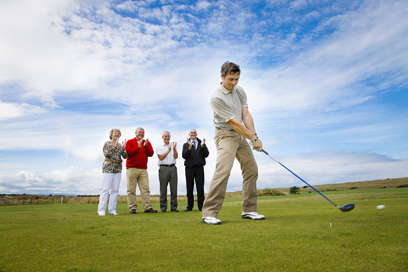 The clubs have now produced 6,687 bookings which have brought 19,426 golfers into North Wales. “They have generated £468,351 in tee time revenue – but that figure does not take into account the money the visiting golfers also spend on things like accommodation, petrol, food and drink and other purchases. “The majority of golfers coming to North Wales are from around the Midlands and North West of England which is our key target area. “Encouragingly, the Ryder Cup has generated a great deal of interest from across the pond in the United States of America. 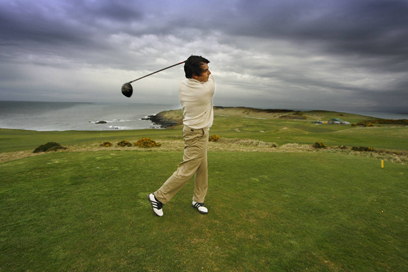 “More and more American golfers are discovering our fantastic courses here in Wales. “Our decision to concentrate our efforts online has been extremely important. The ability to book online 24.7 is vital. “The system enables people to book up to six courses at a time, so you can organise a whole week of golfing in one fell swoop. “We’re also working with our colleagues down at Visit Wales to maximise our marketing efforts in a coordinated way and get the message out there. “In addition, we’re running a major competition this summer for one person to win a 4-ball voucher at all 30 of our top clubs. “This ties in with the Ryder Cup Summer professional tournaments in Wales, held at Conwy and Harlech. “I think this is a key year for us. We have to take full advantage of the opportunities created by the Ryder Cup and maintain the momentum afterwards. “We have some great courses here in North Wales both parkland and links courses. “They offer great value for money – some of our tee times are the best value in Europe – so we have a really great golfing offer.